On 1 March 2016 the Minister of Education, Arts and Culture, Honourable Katrina Hanse – Himarwa, officially launched the “Future in a Bag” project at the Pupkewitz Toyota showroom in Windhoek. During the event 25 learners of Auas Primary School each received a schoolbag, stationery, lunchbox and water bottle. 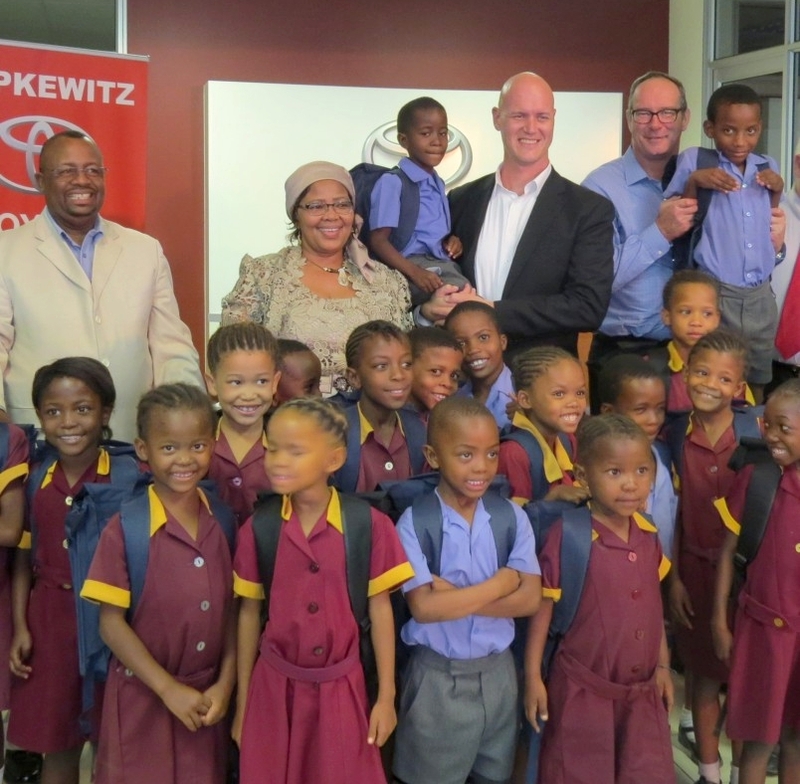 Dealer Principal, Anton Westraadt said as a commercial entity, Pupkewitz Toyota sells its products and services to its valued customers in Namibia -activities that enable the company to generate profits by which its employees are paid and developed. Subsequently, the company contributes to the country’s Fiscus in the form of taxes and aligns its profits to noble causes such as these. The motivation of the project is for the Dealership to donate one school bag to a child in need, whenever a new vehicle is sold. He then extended the challenge to Pupkewitz Toyota customers by encouraging them to support the cause and do the same, whenever they buy a new vehicle. The project not only stresses the importance of a balanced educational environment, but the need to restore children’s excitement for school, by having a school bag they can be proud of. An intent that was emphasized by the Minister as well: “A bag full of learning materials and a prolific educational environment can boost any child’s emotional, social and cognitive abilities. Subsequently, that child will finish formal and tertiary education and participate in various internship and development programmes offered by the Pupkewitz Group”, she said. According to Mr. Isak Kongoro, Principal of Auas Primary School, many children do not enjoy the comfort and luxury of something as basic as a school bag. This is because they simply cannot afford it and alternatively make use of carry bags or plastic shopping – bags”, he highlighted. Pupkewitz Toyota will collect school bags over a period of three months, after which specific schools, that were identified by the Directorate of Education in the Khomas region will benefit from this initiative for the rest of the year. Employees will then be deployed to hand the bags over at the identified schools.